On Monday night, June 2nd, readers emerged from the fog to gather in The Booksmith on Haight Street for the release of McSweeney’s‘ Thirteen Crime Stories from Latin America. McSweeney’s managing editor Daniel Gumbiner and translators Katherine Silver and Joel Streicker discussed the compilation of this issue, for which emerging and established writers from ten different Latin American countries were asked to write crime stories taking place in their home countries. Daniel explained that crime fiction does not exist as a genre in Latin America. Yet, as Joel noted, the nature of a crime itself can reveal something about the society in which it takes place. The stories in this issue address class, nuances of religious culture, gentrification, myth, and, of course, crime. This is the 46th issue of McSweeney’s. You can read a review at NPR here. The Portuguese and Spanish versions of the stories found in this issue are set to be released in September by Companhia des Letras and Literatura Random House. 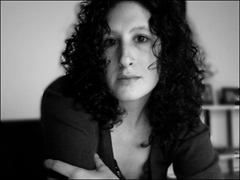 Lindsay Merbaum is a fiction writer whose work has appeared in publications such as PANK, Epiphany, Anomalous Press, The Collagist, Dzanc Books Best of the Web, and Harpur Palate, among others. Honors and awards include nominations for a storySouth Million Writers Award, a scholarship to Disquiet International Literary Program in Lisbon, and the Himan Brown Award for Fiction from Brooklyn College, where she earned her MFA. Lindsay is currently at work on a novel, The Wailing Room.